For you to love her while she lives and mourn for when she's dead. You'll always have her memories as solace for your grief. And from the folk that crown life's land I have chosen you. Nor hate me when I come to take my bobtail back again? I fancied that I heard them say "Dear Lord, Thy will be done"
For all the joys this pup will bring the risk of grief we'll run. In memory of her, we loved, to help us while we grieve. 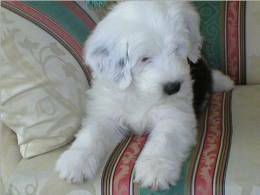 We'll have another sheepdog pup and we'll love her all her life.